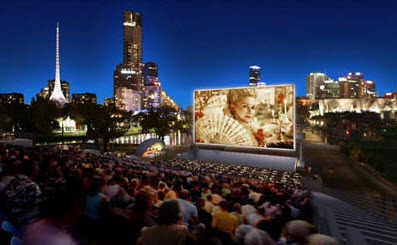 What better way to spend an evening than watching classic movies under the stars in one of Melbourne's outdoor cinema's. Now a Melbourne tradition, cinemas pop-up in early December, operating throughout summer until late April. Most provide seating, albeit deckchairs, some allow beanbags, others picnic on the grass and enjoy the night air and big screen. What happens when it rains: despite Melbourne's weather, you should be fine, according to the Bureau of Meteorology the average number of 'rainy days' is 10 in December, eight in January and just seven in February. The Cameo Outdoor Cinema provides the perfect summer cinematic experience; quality, new release movies in the fresh air and beautiful surrounds of the Dandenong Ranges. Fully licen ..